Updated Tuesday June 20, 2017 by LYB. As you may have heard from the news and social media, the flash flooding from Friday's storms did a number on our complex. 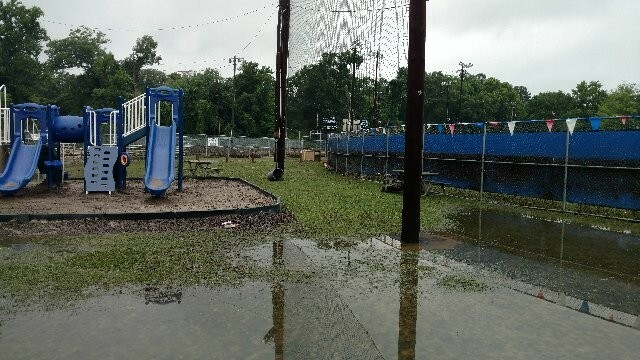 Lakeside Youth Baseball's complex is no stranger to flooding. The streams and creeks that partially surround our facility and provide the uniquely beautiful grounds also present the risk of floods under the right circumstances. Our loss from the storm consists of baseball gear, gear bags, concession equipment and inventory, pitching machines, and lost revenue. Especially as we were counting on concession revenues from the upcoming tournaments to help close out costs on this season and start up expenses for next season. We are going to offer a t-shirt for sale to raise some funds (details to come) and you may also donate directly via our website or by mailing a check to our mailing address: Lakeside Youth Baseball, PO Box 9575, Henrico VA 23228. If you prefer to help with complex clean up in our concession stand or equipment room please contact treasurer@lakesideyouthbaseball.org.